You will enjoy its convenience because you never have to vacuum, wax, or reseal your floors. Additionally, tile flooring is perfect for people with allergies. Unlike some types of flooring, it doesn’t hold in allergens. A simple sweep and mop every now and then is sufficient to keep floors free of dust, pollen, and pet dander. When you make a selection from our artful collection of high-quality flooring options, you aren’t simply renovating--you’re refreshing, renewing, and revitalizing your home. Breathe new life into any interior design scheme with one of the fashionable flooring options from our fully stocked showroom. We offer a diverse selection of the industry’s leading brands. From woodgrain tile to glass and mosaic tiling, we are proud to provide you with floors that help highlight your personal sense of style. For the perfect blend of performance, style, and value, Floorcraft brand tile flooring is a prime choice. You can also satisfy your decorating plans and your family’s lifestyle requirements with attractive flooring options from HomeCraft. Create a one-of-a-kind space with porcelain, ceramic and natural stone tile options from Daltile. With a wide range of vibrant colors and natural textures, you are sure to find the perfect flooring option for your needs, no matter what project you have in mind. Manufactured through the process of rapidly heating and cooling natural clay and minerals, ceramic tile has remained one of the most desirable flooring materials for decades. Marked by stunning visual appeal and incredible longevity---with the right care, your flooring will look like new for years to come. Outfit any utility room in your home with this unique material to achieve the look and feel you desire. Give any room an instant makeover with ceramic flooring and improve your overall value of your home. No matter what your stylistic preferences may be, you are sure to find a suitable option with help from our sensible flooring team. Due to their distinct veining, our flooring options are available in a variety of exquisite patterns. Offering exceptional water resistance, our ceramic floors are a great choice for bathroom, kitchen, and laundry room renovations where there is moisture in abundance. Spills and water simply rest on the surface of the tiles, allowing you to wipe them away with ease without having to worry about moisture seeping through and causing mold. Porcelain tile is a hard-wearing material that can keep its appearance with responsible maintenance. Made from a fine, dense clay fired at high temperatures to ensure their sturdiness, they are sure to make a great addition to your home. Our porcelain tiles have a high breaking strength and high resistance to staining, scratching, and cracking, making them Ideal for areas prone to foot traffic like kitchens and entryways. Due to its water resistance, porcelain tile is easy to clean in the event of a spill and doesn’t harbor bacteria. Like ceramic, porcelain keeps moisture on its surface, preventing mold from growing beneath your flooring. Homeowners with allergies and those who prefer to keep their home exceptionally clean are sure to find comfort in tile floors. Our porcelain flooring has a distinctive, delicate appearance, but is strong enough to withstand the daily wear and tear of high-traffic rooms and the effects of moisture. No matter what your renovation plans are, our specialists are happy to help you find a selection that perfectly fits your needs. Slate tile flooring is a stylish investment that offers a smooth, soft texture to walk upon and makes for lasting value. Frequently used in outdoor applications, slate tiling is an ideal choice for anyone in need of a heavy-duty, waterproof flooring option. In addition its durability, slate is fire resistant, stain resistant, and low maintenance. Available in a number of colors and finishes, this alternative flooring option can be easily customized and made to fit nearly any atmosphere. 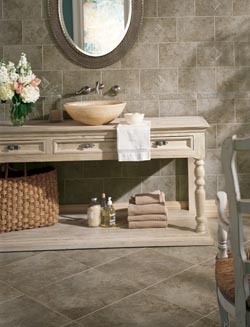 Due to natural variations in composition, each stone tile is different and offers a one-of-a-kind look. Not only is stone tile flooring aesthetically pleasing, but it’s also a wonderful option for a number of rooms throughout the home. Resistant to water and moisture, tile works great in kitchens and bathrooms where spills often occur. Its water resistance helps prevent the growth of mold under your flooring, protecting your family and visitors and gives you a more sanitary home. It is also a great option in dining rooms, living rooms, entryways, and hallways because of its ease of maintenance. Perfect for people with allergies, a simple sweep and mop every now and then is sufficient enough to keep slate tile floors free of dust, pollen, pet dander, and other contaminants. Our commitment to you doesn’t end after you’ve made your selection. As your locally preferred resource for high-quality flooring solutions, our team is dedicated to earning your complete satisfaction from the initial consultation to the installation. Once you’ve chosen the perfect tile for your remodeling project, let our trained tile flooring installation team provide you with high-quality workmanship. We understand that no two flooring jobs offer the same challenges. That’s why our professional flooring specialists handle your needs with an individualized approach. We take the time to ensure that we get the proper measurements for your project. Afterwards, we provide with an accurate, honest outline to clarify your budget and allow you to focus on your product choices. You won’t have to worry about purchasing too much or too little. With our team, you are sure to receive just what you expect. When you choose our tile flooring specialists, we’re with you from beginning to end. Let our experts help you transform your home with flooring that offers outstanding performance, durability and, unmatched beauty. No matter how ambitious your renovations are, you can rest assured that you’re getting beautiful, long-lasting tiles installed by experienced professionals. Contact our flooring specialists to learn more about our tile flooring options. Our specialists are eager to help you find the best flooring option for your needs. We proudly serve homeowners throughout Baton Rouge, Louisiana.